Looking back on the final trading week of a very eventful year, we saw low volume and a break from the recent rallies for domestic indexes. While international stocks in the MSCI EAFE added 0.56%, all major U.S. indexes declined.1https://www.msci.com/end-of-day-data-search The S&P 500 lost 1.10%, the Dow was down 0.86%, and the NASDAQ gave back 1.46%.2http://finance.yahoo.com/quote/%5EGSPC/history?period1=1482469200&period2=1483074000&interval=1d&filter=history&frequency=1d http://finance.yahoo.com/quote/%5EDJI/history?period1=1482469200&period2=1483074000&interval=1d&filter=history&frequency=1d http://finance.yahoo.com/quote/%5EIXIC/history?period1=1482469200&period2=1483074000&interval=1d&filter=history&frequency=1d For the first time since November 4, the indexes posted three straight days of losses.3http://www.cnbc.com/2016/12/30/stocks-open-higher-to-begin-last-trading-session-of-2016.html Despite these last-minute decreases, 2016 ended very differently than it began. Consumer Confidence Surge: On December 27, Consumer Confidence beat expectations to reach 113.7 — a 13-year high.6http://www.cnbc.com/2016/12/27/consumer-confidence-for-december-2016.html This metric indicates that consumers feel more positively about jobs, personal finances, business conditions, and more. We all know that 2016 brought its fair share of surprises — from victories for Brexit and Donald Trump to our recent stock market rally and beyond. However, the year ended with domestic indexes up and a number of positive economic indicators. As we look toward 2017, we see opportunities for continued growth, as well as many questions that no one can yet answer. Will President Trump reduce regulation and taxes? Will OPEC keep its pledge to lower oil output? How will China’s economy perform? Could more “Brexits” be on the horizon? The questions remain, but no matter the answers, we are here to help guide you through the year—and toward your goals—with proactive, strategic support. If you want to talk about what we experienced in 2016, or what we anticipate for the year ahead, we are always here for you. 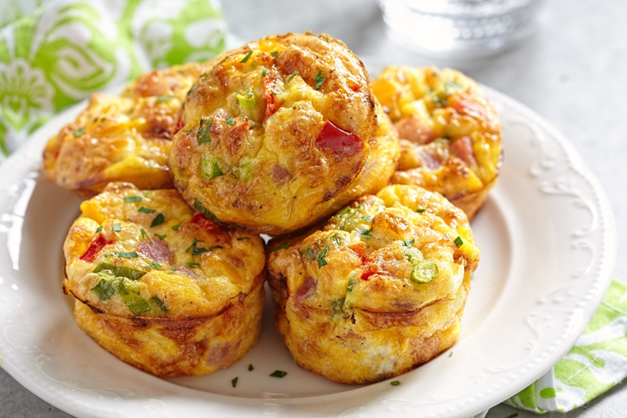 Enjoy breakfast classics baked into one tasty meal! Prepare a round 2-quart baking dish by lightly misting it with cooking spray. Arrange a layer of toasted English muffin halves face-down in the baking dish, forming an overlapping shingled pattern. Arrange a layer of ham on top of the English muffin layer below. Repeat steps 2 and 3 until you’ve layered all the English muffins and ham. Sprinkle the top with scallions and 1/2-cup of shredded cheese. Pour the egg mixture into the baking dish, cover with plastic wrap, and refrigerate for at least 5 hours or overnight. Discard plastic wrap and sprinkle remaining 1/2-cup cheese over casserole. Place dish on rimmed baking sheet and put into oven. Bake until the eggs are firm in the middle and edges lightly brown, about 1 hour. Let stand 10 minutes before slicing and serving. With tax-filing season coming up, IRS impersonations and scams are upon us, too. If you receive a phone call, email, or text saying that the IRS is “threatening you with lawsuits or jail unless you pay immediately,” this communication is a scam. Contact the Treasurer Inspector General for Tax Administration (TIGTA): Use the “IRS Impersonation Scam Reporting” web page. You can also call 800-366-4484. Report to the Federal Trade Commission: Use the “FTC Complaint Assistant” on gov, and add “IRS Telephone Scam” in the notes. A very common challenge many golfers have is slicing the golf ball to the right, which makes them lose distance and accuracy. To compensate, golfers usually do an “over the top move” by bringing their hands, arms, and elbows far away from their body on the downswing and then swinging their club too far left on follow-through. With this move, you only succeed in making even bigger slices. You can see if your technique is off by checking your tennis swing. In tennis, people often try to hit the ball over the net by extending their elbow too far away from their body. Grab a tennis racket and ball, and practice your swing to see where you point your elbow. With an accurate stroke, you should point your elbow down and keep it close to your side when you hit the ball. In this stance, you can add more power and control by rotating your body, rather than flaring out your arm. Place the club in your dominant hand. Hold the club a little above the ground. Imagine a ball coming at you (like tennis) and hit a forehand. Do this motion multiple times until you feel instincts take over and hit like you’re using a hard forehand. After repeating this drill, you should feel your elbow pointed downward on the downswing. Remember: To play well, you must use your whole body, not just your arms. Practicing this stroke will help you bring your whole body into play and avoid a big slice. Garlic is not only a great flavor to use when cooking—it also has a host of health benefits. From helping to treat high blood pressure to calming earaches and more, studies show that garlic can do a lot more for you than just making your next batch of pesto more delicious. Most of garlic’s health benefits are due to the compound allicin, which activates once crushed and is garlic’s defense mechanism to being “attacked.” To make sure you maximize the health benefits, let your crushed or chopped garlic sit out for at least 10 minutes before cooking with it. Nutrient-rich compost is nature’s homemade fertilizer—and your daily cooking and yard chores can help you create a powerful compost that your gardens will love. With these simple steps, you can start your own composting, but just keep in mind that you’ll probably need a full year before your compost is ready to use. Choose Your Container: Begin your compost by deciding how you want to manage the pile. A sealed composting bin with a front door will lay on the ground and require full manual mixing. A composting barrel will be on a stand and allow you to turn a crank and tumble it. A traditional composting heap requires an open-air structure to contain the matter and manual mixing. Start Piling: All vegetable and fruit scraps can go into a compost (as well as coffee grounds), and you can also include paper, newspapers, small sticks, grass clippings, and straw. Do not, however include meat or dairy products. If you are doing an organic compost, only use food labeled organic, so you don’t introduce unwanted chemicals into the compost. Use the Right Ratio: A healthy compost maintains the right carbon-to-nitrogen ratio. To produce fertile, aromatic compost, make sure you have approximately 25- to 30-parts carbon to one-part nitrogen. If your compost is too smelly, you may have too much nitrogen. If your compost decomposition slows down, you may have too much carbon. You can research which food items to add to your compost that are high in nitrogen (such as coffee grinds) or high in carbon (such as carrots) and will help you bring your levels back to normal. Stir Regularly: Compost needs mixing every few days, in order to aerate the soil and speed up decomposition. Use a garden fork to mix if you use a traditional compost or bin. Turn the crank to mix the compost if you use a barrel. Keep It Warm: Composts need warmth for the matter to break down, and the ideal temperature is between 140° and 160° This need for heat is why many bins are black — so they can absorb sunlight. If you have a heap instead of a container, be sure to cover your compost with a black tarp in colder weather. You’ll know your compost is ready by how it looks: When the matter is broken down and has the appearance of rich, healthy soil, it’s ready to use. Happy composting!